The studio that constitutes the residency is tiny but pristinely clean and very well thought out. 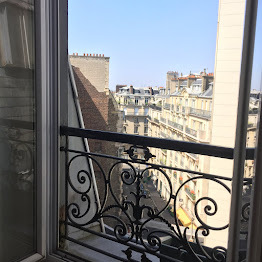 There is a lot of natural light, a real Parisian rooftop window with a wrought iron railing and a skylight at the other end of the room. There is a kitchen corner with a small expandable table, a well-equipped kitchenette (no oven but combo microwave), a small fridge and good, well thought-out storage space and a lovely view. The studio is far enough away from the main street that you can work with the window open. There is a spacious wardrobe just to the left of the front door (from which the pano shot above is taken) where you will find plenty of bedlinen. It's just big enough to put away your suitcase but if you have a lot of clothes, you might want to pack in a soft bag that you can fold away. The book shelves between the kitchen corner and the bathroom hold a number of handy Paris guide books (including a whole book devoted to Parisian Patisseries!). 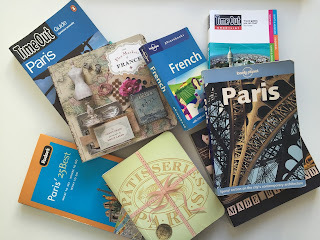 Books on Paris. And a French Phrase book! 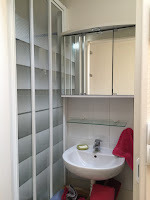 Even the bathroom has a bit of natural light as the skylight straddles both rooms. 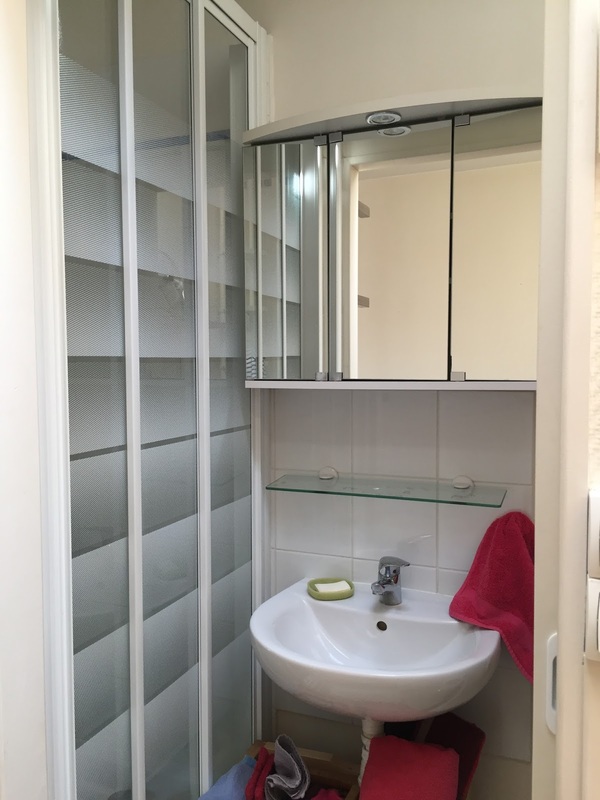 There is a shower, a toilet, a fan heater and a basket with towels (so no need to bring any), separated from the main room by a sliding door. In the corner under the skylight, is the L-shaped desk, tiny but well lit and with loads of storage within easy reach, which makes it a delight to work at. Over it hang a series of white magnetic boards which can be used for ideas, inspiration etc to create your own personal writing space. Abi Box sitting at the desk writing this website. Between the desk and the door is a queen size sofa bed which easily folds out for the night. There is also wifi and lots of little shelves and well positioned hooks that makes this a very practical little space for an organised person. But this is going to work best if you are someone who can put things back where you found them. 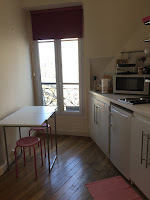 There is no washing machine so we ask that you use the nearest launderette (5 min walk away on Rue Mayet, wash/dry takes 2 hours) to wash your bedlinen before you leave. You will receive more information about all that when you are ready to book but you will have to leave time to wash the bedlinen and clean the flat thoroughly before you leave. We put our energy into linking you into the poetry community in Paris, put you in touch with past and future residents. You will have to be ready to put energy into good housekeeping in return. This is not a serviced appartment. There is a hoover in the cupboard and some cleaning materials and we kindly ask residents to immediately replace any bottles that might end up empty during their stay. If everyone makes an effort to leave the studio not just in the state they found it but in the cleanest state they can muster and possibly in a better state still, it leaves us with the best chance of being able to continue offering this to many more poets in the future. Really, if you are a messy character and don't like cleaning, please don't apply.